2005-01-13 Assigned to MEDTRONIC, INC. reassignment MEDTRONIC, INC. ASSIGNMENT OF ASSIGNORS INTEREST (SEE DOCUMENT FOR DETAILS). 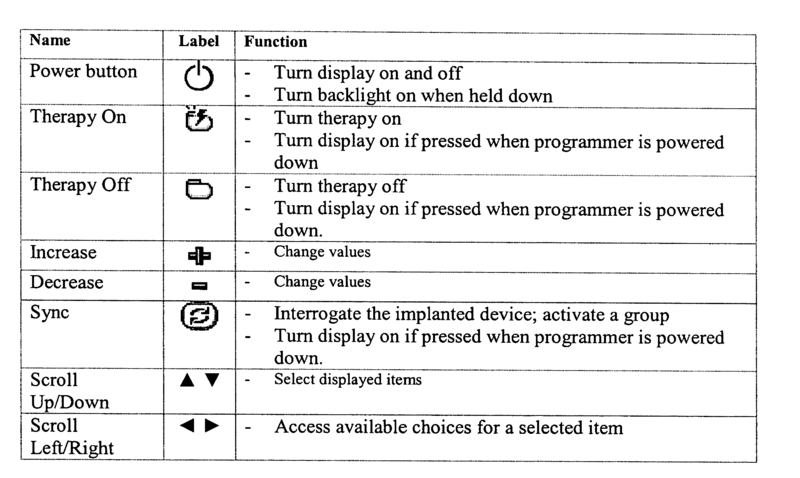 Assignors: SCHOMMER, MARK E., BAUHAHN, RUTH E.
User interface for external power source, recharger, for an implantable medical device. At least some of patient controls and display icons of an energy transfer unit are common with at least some of the patient controls and the display icons of a patient control unit. An energy transfer unit is operable by the patient with less than three operative controls to control energy transfer from the external energy transfer unit to the implantable medical device. An external antenna having a primary coil can inductively transfer energy to a secondary coil of the implantable medical device when the external antenna is externally placed in proximity of the secondary coil. An energy transfer unit has an external telemetry coil allowing the energy transfer unit to communicate with the implantable medical device through the internal telemetry coil in order to at least partially control the therapeutic output of the implantable medical device. This application is claims priority to U.S. Provisional Application Ser. No. 60/508,198, filed Oct. 2, 2003, entitled User Interface for External Charger for Implantable Medical Device, and from U.S. Provisional Application Ser. No. 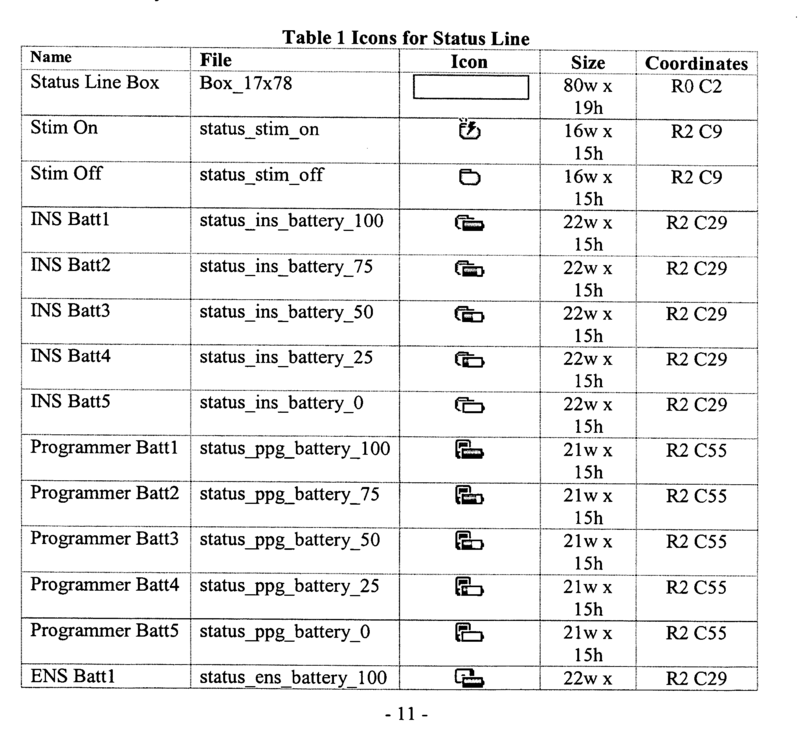 60/513,732, filed Oct. 23, 2003, entitled User Interface for External Charger for Implantable Medical Device. The entire contents of both of the foregoing applications are hereby incorporated by reference. This invention relates to implantable medical devices and, in particular, to energy transfer devices, systems and methods for implantable medical devices. Implantable medical devices for producing a therapeutic result in a patient are well known. Examples of such implantable medical devices include implantable drug infusion pumps, implantable neurostimulators, implantable cardioverters, implantable cardiac pacemakers, implantable defibrillators and cochlear implants. Of course, it is recognized that other implantable medical devices are envisioned which utilize energy delivered or transferred from an external device. A common element in all of these implantable medical devices is the need for electrical power in the implanted medical device. The implanted medical device requires electrical power to perform its therapeutic function whether it be driving an electrical infusion pump, providing an electrical neurostimulation pulse or providing an electrical cardiac stimulation pulse. This electrical power is derived from a power source. Typically, a power source for an implantable medical device can take one of two forms. The first form utilizes an external power source that transcutaneously delivers energy via wires or radio frequency energy. Having electrical wires which perforate the skin is disadvantageous due, in part, to the risk of infection. Further, continuously coupling patients to an external power for therapy is, at least, a large inconvenience. The second form utilizes single cell batteries as the source of energy of the implantable medical device. This can be effective for low power applications, such as pacing devices. However, such single cell batteries usually do not supply the lasting power required to perform new therapies in newer implantable medical devices. In some cases, such as an implantable artificial heart, a single cell battery might last the patient only a few hours. In other, less extreme cases, a single cell unit might expel all or nearly all of its energy in less than a year. This is not desirable due to the need to explant and re-implant the implantable medical device or a portion of the device. One solution is for electrical power to be transcutaneously transferred through the use of inductive coupling. Such electrical power or energy can optionally be stored in a rechargeable battery. In this form, an internal power source, such as a battery, can be used for direct electrical power to the implanted medical device. When the battery has expended, or nearly expended, its capacity, the battery can be recharged transcutaneously, via inductive coupling from an external power source temporarily positioned on the surface of the skin. Transcutaneous energy transfer through the use of inductive coupling involves the placement of two coils positioned in close proximity to each other on opposite sides of the cutaneous boundary. The internal coil, or secondary coil, is part of or otherwise electrically associated with the implanted medical device. The external coil, or primary coil, is associated with the external power source or external charger, or recharger. The primary coil is driven with an alternating current. A current is induced in the secondary coil through inductive coupling. This current can then be used to power the implanted medical device or to charge, or recharge, an internal power source, or a combination of the two. Since it may be necessary for the patient to operate the external power source and since the patient may not be medically skilled nor electronically skilled, it is desirable that the external power source have a user interface that is both intuitive and simple to use and operate. In an embodiment, the present invention provides an implantable medical device system. An implantable medical device provides a therapeutic output to a patient. An external patient control unit can be operatively coupled via telemetry with the implantable medical device allowing the patient to control the therapeutic output of the implantable medical device. An external energy transfer unit can be operatively coupled to the implantable medical device to transcutaneously transfer energy to the implantable medical device. The external patient control unit has a user interface operable by the patient having patient controls and display icons indicative of a status of operation of the patient control unit. The energy transfer unit has a user interface operable by the patient having patient controls and display icons indicative of a status of operation of the energy transfer unit. At least some of the patient controls and the display icons of the energy transfer unit are common with at least some of the patient controls and the display icons of the patient control unit. In another embodiment, the present invention provides an external energy transfer unit adapted to transcutaneously transfer energy to an implantable medical device for providing a therapeutic output to a patient. The implantable medical device is capable of communication with an external patient control unit allowing the patient to control the therapeutic output of the implantable medical device. The external patient control unit has a user interface operable by the patient having patient controls and display icons indicative of a status of operation of the patient control unit. A user interface operable by the patient has patient controls and display icons indicative of a status of operation of the energy transfer unit. At least some of the patient controls and the display icons of the energy transfer unit are common with at least some of the patient controls and the display icons of the patient control unit. In another embodiment, the present invention provides a method of providing therapeutic output to a patient using an implantable medical device. An external patient control unit is operatively coupled via telemetry with the implantable medical device allowing the patient to control the therapeutic output of the implantable medical device. An external energy transfer unit is operatively coupled to the implantable medical device to transcutaneously transfer energy to the implantable medical device. The external patient control unit has a user interface operable by the patient having patient controls and display icons indicative of a status of operation of the patient control unit. The energy transfer unit has a user interface operable by the patient and has patient controls and display icons indicative of a status of operation of the energy transfer unit. At least some of the patient controls and the display icons of the energy transfer unit are common with at least some of the patient controls and the display icons of the patient control unit. In a preferred embodiment, at least one of the display icons is an icon representative of a state of charging of an energy storage device in the implantable medical device. In a preferred embodiment, at least one of the patient controls is a control for adjusting the therapeutic output of the implantable medical device. In a preferred embodiment, the external energy transfer unit inductively couples energy to the implantable medical device. In a preferred embodiment, the implantable medical device has a rechargeable energy storage device and wherein the energy transfer unit charges the rechargeable energy storage device. In another embodiment, the present invention provides an implantable medical device system. An implantable medical device provides a therapeutic output to a patient. An external energy transfer unit can be operatively coupled to transcutaneously transfer energy to the implantable medical device. The energy transfer unit is operable by the patient with less than three operative controls to control energy transfer from the external energy transfer unit to the implantable medical device. In another embodiment, the present invention provides an external energy transfer unit adapted to transcutaneously transfer energy to an implantable medical device for providing a therapeutic output to a patient. Energy transfer circuitry transcutaneously transfers energy to the implantable medical device. Less than three operative controls control energy transfer from the external energy transfer unit to the implantable medical device. In another embodiment, the present invention provides a method providing a therapeutic output to a patient with an implantable medical device. An external energy transfer unit is operatively coupled with the implantable medical device to transcutaneously transfer energy to the implantable medical device. The energy transfer unit is controlled with less than three operative controls to control energy transfer from the external energy transfer unit to the implantable medical device. In a preferred embodiment, the energy transfer unit is operable with two operative controls to control energy transfer from the external energy transfer unit to the implantable medical device. In a preferred embodiment, the two operative controls comprise a start control and a stop control. In a preferred embodiment, the start control is a start button and wherein the stop control is a stop button. In a preferred embodiment, the energy transfer unit also has operative controls to start and stop the therapeutic output of the implantable medical device. In a preferred embodiment, the energy transfer unit also has a control to enable and silence audio feedback from the energy transfer unit. In another embodiment, the present invention provides an implantable medical device system. An implantable medical device provides a therapeutic output to a patient. The implantable medical device is capable of receiving inductively coupled energy with a secondary coil and is capable of being transcutaneously controlled using an internal telemetry coil. An external antenna has a primary coil adapted to inductively transfer energy to the secondary coil of the implantable medical device when the external antenna is externally placed in proximity of the secondary coil. An external energy transfer unit is adapted to be operatively coupled by a cord to the external antenna driving the primary coil to inductively transfer energy to the implantable medical device. The energy transfer unit has an external telemetry coil allowing the energy transfer unit to communicate with the implantable medical device through the internal telemetry coil in order to at least partially control the therapeutic output of the implantable medical device. In another embodiment, the present invention provides an external energy transfer system adapted to transcutaneously transfer energy to an implantable medical device for providing a therapeutic output to a patient. The implantable medical device is capable of receiving inductively coupled energy with a secondary coil and is capable of being transcutaneously controlled using an internal telemetry coil. An external antenna has a primary coil adapted to inductively transfer energy to the secondary coil of the implantable medical device when the external antenna is externally placed in proximity of the secondary coil. An external energy transfer unit is adapted to be operatively coupled by a cord to the external antenna driving the primary coil to inductively transfer energy to the implantable medical device. The energy transfer unit has an external telemetry coil allowing the energy transfer unit to communicate with the implantable medical device through the internal telemetry coil in order to at least partially control the therapeutic output of the implantable medical device. In another embodiment, the present invention provides a method of controlling an implantable medical device for providing a therapeutic output. The implantable medical device is capable of receiving inductively coupled energy with a secondary coil and is capable of being transcutaneously controlled using an internal telemetry coil. Energy is inductively transferred to the secondary coil with an external antenna having a primary coil when the external antenna is externally placed in proximity of the secondary coil. The primary coil is driven with an external energy transfer unit operatively coupled by a cord to the external antenna to inductively transfer energy to the implantable medical device. An external telemetry coil in the energy transfer unit communicates with the implantable medical device through the internal telemetry coil in order to at least partially control the therapeutic output of the implantable medical device. In a preferred embodiment, the inductively transferring step and the communicating step occur simultaneously. In a preferred embodiment, the energy transfer unit can control the implantable medical device to turn the therapeutic output on and off. In a preferred embodiment, the energy transfer unit can control the implantable medical device using the external telemetry coil while transferring energy to the implantable medical using the primary coil of the antenna. FIGS. 23A and 23B illustrate screens, information messages and warnings. In FIG. 1, external programming unit 2 is attachable via cord 4 to an external telemetry coil 6. External programming unit 2 can program operations implantable medical device 16 (FIG. 2) in a conventional manner using external telemetry coil 6. External antenna 52 is attachable via cord 56 to external charging device 48 is inductively transfer power to implantable medical device 16 when external antenna 52 is placed in proximity of a secondary coil 24 associated with implantable medical device 16. External charging device 48 receives AC power from cord 8 through transformer 10. External antenna 52 can be held in position on patient 18 with belt 12. FIG. 2 illustrates an embodiment of implantable medical device 16 situated under cutaneous boundary 38. Charging regulation and therapy control is conventional. Implantable medical device 16 also has internal telemetry coil 44 configured in conventional manner to communicate through external telemetry coil 46 to an external programming device 2, charging unit 50 or other device in a conventional manner in order to both program and control implantable medical device and to externally obtain information from implantable medical device 16 once implantable medical device has been implanted. Internal telemetry coil 44, rectangular in shape with dimensions of 1.85 inches (4.7 centimeters) by 1.89 inches (4.8 centimeters) constructed from 150 turns of 43 AWG wire, is sized to be larger than the diameter of secondary charging coil 34. Secondary coil 34 is constructed with 182 turns of 30 AWG wire with an inside diameter of 0.72 inches (1.83 centimeters) and an outside diameter of 1.43 inches (3.63 centimeters) with a height of 0.075 inches (0.19 centimeters). Magnetic shield 36 is positioned between secondary charging coil 34 and housing 32 and sized to cover the footprint of secondary charging coil 34. Internal telemetry coil 44, having a larger diameter than secondary coil 34, is not completely covered by magnetic shield 36 allowing implantable medical device 16 to communicate with the external programming device with internal telemetry coil 44 in spite of the presence of magnetic shield 36. Rechargeable power source 24 can be charged while implantable medical device 16 is in place in a patient through the use of external charging device 48. In a preferred embodiment, external charging device 48 consists of charging unit 50 and external antenna 52. Charging unit 50 contains the electronics necessary to drive primary coil 54 with an oscillating current in order to induce current in secondary coil 34 when primary coil 54 is placed in the proximity of secondary coil 34. Charging unit 50 is operatively coupled to primary coil by cable 56. In an alternative embodiment, charging unit 50 and antenna 52 may be combined into a single unit. Antenna 52 also contains external telemetry coil 46 which may be operatively coupled to charging unit 50 if it is desired to communicate to or from implantable medical device 16 with external charging device 48. Alternatively, antenna 52 may contain external telemetry coil 46 which can be operatively coupled to external programming device 2, either individually or together with external charging unit 48. The user interface of external programming unit 2 is illustrated by reference to FIG. 3 through FIG. 16. 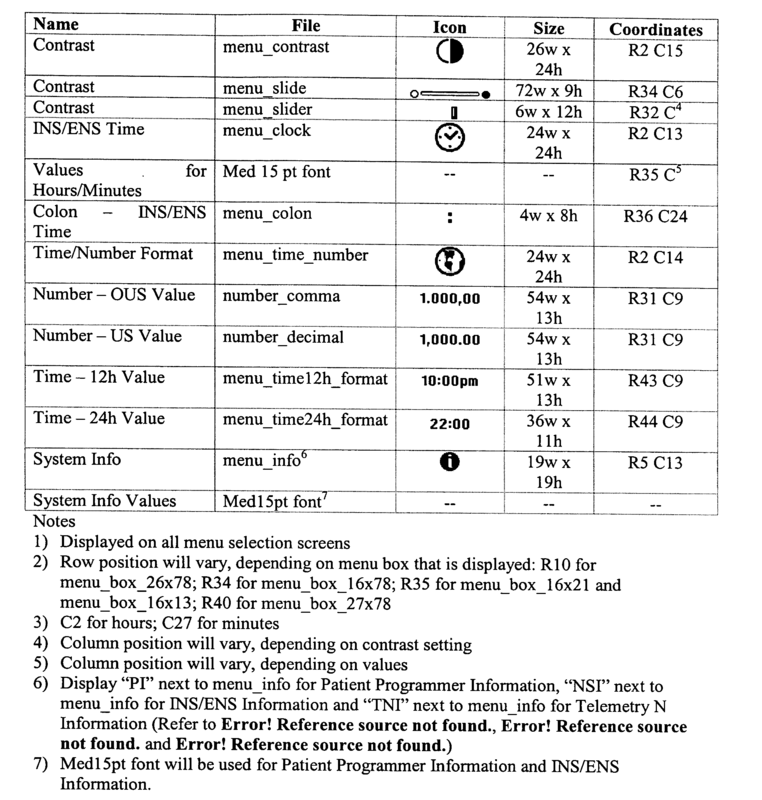 The following terms are used throughout the description of the user interface of external programming unit 2. As noted below in the explanation of acronyms utilized in the following paragraphs and table, DTC refers to desktop charger which is used to denote the AC power supply (transformer 10) and power cord (cord 8). The DTC is “docked” when external charger 48 is connected to an source of AC power. The DTC is “undocked” when external charger 48 is disconnected from a source of AC power. Refer to FIG. 3 and FIG. 4 for start-up flow and navigation flow, respectively. User interface components in the keypad are shown below. 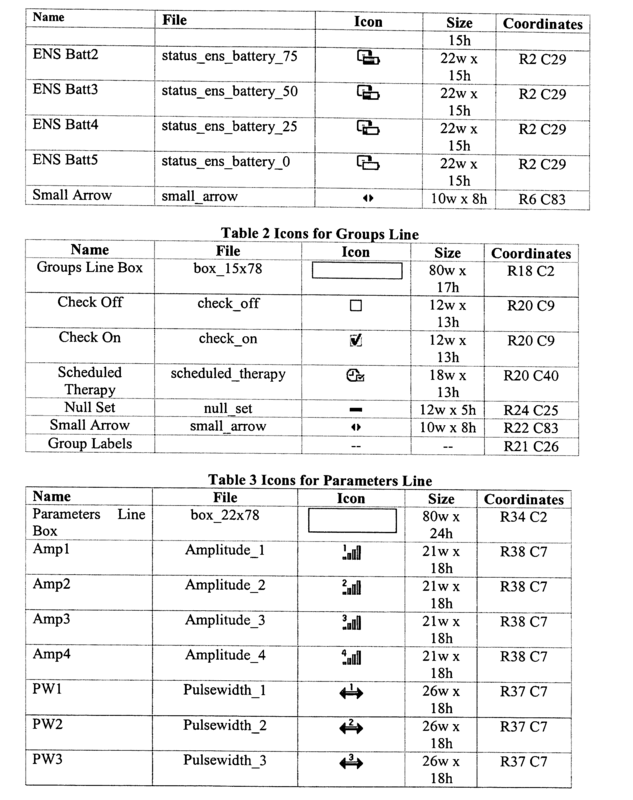 Icons are shown in Tables 1-6 below. Therapy status screen display layout is divided vertically into three lines of information: status line, groups line and parameters line as shown in FIG. 5. When a successful initial interrogation has been performed, software will display the Therapy Status Screen of the active set with the following highlighting priority: parameters line if displayed; groups line if displayed; and status line. Scroll up and scroll down keys will be used to access the status line, groups line and parameters line on the display. A box highlights user selection. Scroll left and right will be used to cycle through available choices for a selected line. Software will display a “real-time” INS charge level on the status line. The charge level will be updated and displayed whenever a parameter adjustment is made. Software will display programmer battery status on the status line. Access to Menu Selections is from the status line are shown in FIG. 6. Initial interrogation will include data on all groups currently available to the patient (“Baseline” setting). Software will display labels for all groups the user can activate, including those containing no adjustable parameters. Refer to FIG. 7 for Group Selections. All unnecessary text will be removed from the display: e.g., if there is only 1 group, software will not display the groups line. Software will not display parameters that the user cannot adjust: i.e., the clinician programmer disallows access or upper and lower limits are the same. The user will access all available groups by scrolling through a linear list: A, B, C, . . . , Z. When the user scrolls to a different group, software will display the first adjustable parameter in the group. The user will scroll left/right through available groups to access an inactive group. Software will display all adjustable parameters for inactive groups. The user will scroll down to highlight parameters and scroll left or right to view them. If a user presses Therapy Off or Therapy On when the screen displays an inactive group, software will turn the INS off, and display the Therapy Status Screen with the active group highlighted. A check in its check box will be used to indicate an active group (check_on); a check box without a check will be used to indicate inactive groups (check_off). The user will press the Sync key to activate a group at the displayed parameter value(s). The neurostimulator does not have to be on to activate a new group. The user can activate a group when therapy is off. The user can activate a new group when the groups line is highlighted or when the parameters line is highlighted. The check box will be updated whenever a new group is activated. Software will display labels for all parameters the user can adjust as shown in FIG. 8, Parameter Selections. Software will display the first adjustable parameter of the active group when a Sync has been performed for an initial interrogation. The user will access all adjustable parameters by scrolling through a linear list. The order of scrolling through adjustable parameters in a group is Amp1, Amp2, Amp3, Amp4, PW1, PW2, PW3, PW4, Rate, Amp1, . . . Refer to FIG. 8, Parameter Selections. Increase/decrease keys will be inactive until a session has been initiated—i.e., the INS has been interrogated. When the user presses and holds the increase/decrease keys, software will send a change to the neurostimulator every 12 second. When the user changes a parameter, software will display the updated parameter value. Therapy control events are described in screens, information messages and warnings that are displayed on the programmer as shown in FIGS. 9A, 9B and 9C. Operational requirements are described in tables that specify conditions for entry and expected changes in control. The i symbol will be displayed on all information messages as shown in FIG. 9B. The user can clear all messages by pressing the 4-way button (Scroll up/down, Scroll left/right), Therapy Off to turn stimulation off or the Power button to turn the display off. If the system times out, the display will turn off (Power Down Screen). Refer to Table 7. The exclamation mark symbol will be displayed on all warnings as shown in FIG. 9C. All warnings will remain on the display until the user takes appropriate action. Refer to Table 8. 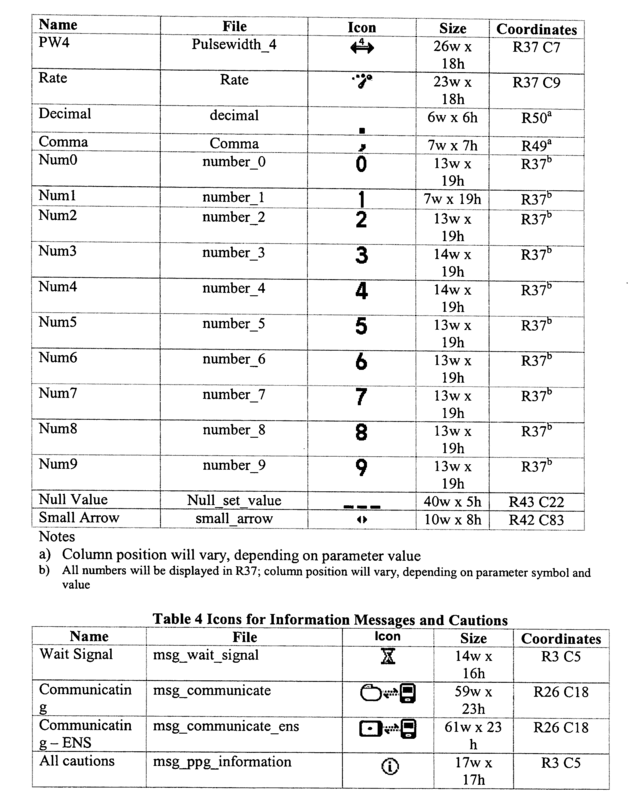 “In the box” messages are described in Table 9. All “In the Box” messages will remain on the display until the system times out or the user presses the Power button to turn off the display. Refer to Table 9. Therapy control events are described in Table 10. Access to menu selections is from the status line on the Therapy Screen as shown in FIG. 10. The display is divided vertically into two lines of information: menu option line and value line. Scroll up and down keys will be used to access the menu option line and the value line on the display. A box highlights user selection. Scroll right and left and increase/decrease keys will be used to change values for Audio, Contrast, Time/Number Format and the Information options. In addition, Increase/decrease keys will be used to change values. Software will display screens for the menu options in Table 11 Menu Selections. The user interface of the external charger is described below. A description of the user interface for an external recharger for an implantable medical device is described. The appearance of the screens and how users interact with these screens are defined. The following terms are used throughout the description of the user interface for the external charger. Refer to FIG. 17 and FIG. 18 for navigation flow. FIG. 17 illustrates a process for charging rechargeable power source 24 in implantable medical device 16 by using external charging device 48. In order to charge rechargeable power source 24, a patient may use belt 12 to attach external antenna 52 to the patient's body at approximately the location of implanted medical device 16. It is desirable that primary coil 54 of external antenna 52 be aligned as closely as possible with secondary coil 34 of implantable medical device 16. Techniques for attaching external antenna 52 to the patient's body and positioning primary coil 54 in close proximity to secondary coil 34 can be found in co-pending U.S. patent application Ser. No. 10/837,506, filed Apr. 30, 2004, the entire contents of which are hereby incorporated by reference. This application claims priority from U.S. Provisional Patent Application Ser. No. 60/508,174, filed Oct. 2, 2003. After affixing external antenna 52 to the approximate location of implantable medical device 16, the patient (or other user such as a medical professional or family member assisting the patient) may then press (step 110) the “Start Charge” button 90 (FIG. 1) on charging unit 50. Charging unit 50 then determines (step 112) if telemetry with implantable medical device 16 is successful. 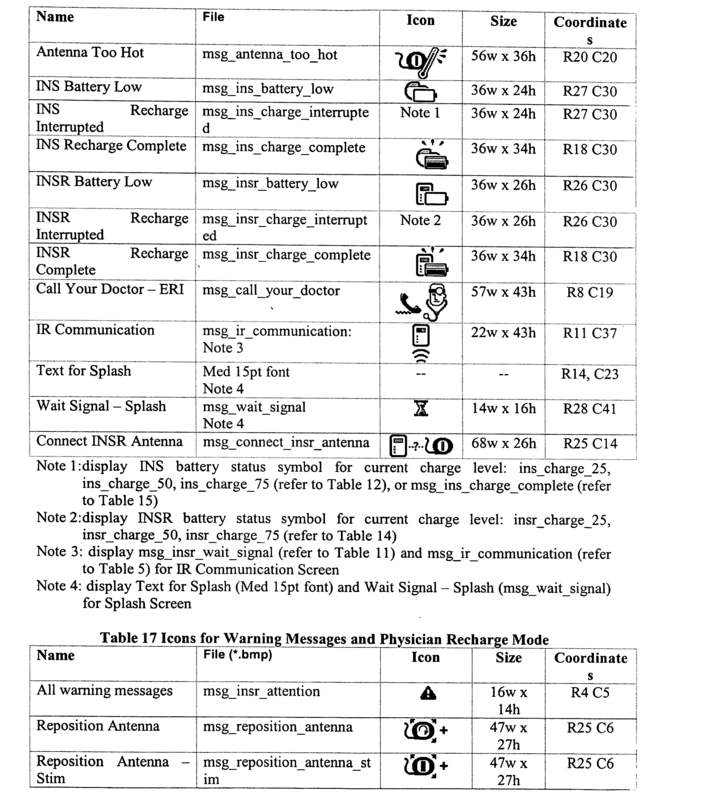 If telemetry is unsuccessful (step 114), an error message is generated such as a telemetry timeout (Reposition Antenna—Press Start Charge), system error (Antenna Too Hot) or external charging device 48 error due to INSR battery low or INSR battery depleted and external charging device displays the appropriate message. If telemetry is successful, then charging unit 50 waits (step 116) and the appropriate charge status may be indicated (step 118) in the display of charging unit 50. If charging of rechargeable power source 24 is not yet complete (step 120), charging unit 50 returns through step 118. The surface temperature of antenna 52 is monitored as well as the charging current and battery voltage levels. An error message is generated and charging is suspended if measurements are not within limits. Once charging of rechargeable power 24 is complete (step 122), charging unit 50 indicates in the display that charging is complete and the user may press the “Stop Charge” button 92 on charging unit 50 to terminate the charging process. Of course, it is to recognized and understood that the “Stop Charge” button 92 may be pressed at any time during the charging process in order to terminate the charging process, i.e., the user need not wait until the complete charging has been indicated. Charging unit 50 may be operated to charge rechargeable power 24 in implantable medical device 16 by the use of only two buttons, namely the “Start Charge” button 90 and the “Stop Charge” button 92. These are the only two buttons which need be used. While a preferred embodiment of charging unit 50 does contain a third button, namely “Silence” button 94, this third button is not necessary. “Silence” button 94 is used only to disable, or to re-enable, audio output of charging unit 50. Since audio feedback is not required for the charging process, this button may be used or not at the convenience of the user. In an alternative embodiment, charging unit 50 may itself be powered by a rechargeable power source, such as a battery. Since the charging process could take several hours, it would be desirable. FIG. 18 illustrates the process used to charge the external charging unit 48. The external charging unit 48 is connected (step 124) to a suitable power source, such as a readily available AC power outlet. A check is made (step 126) to determine whether a “recharge event”, i.e., an alert or alarm condition, has occurred and, if so, issue the appropriate message (step 128). If a “recharge event” has not occurred, the process updates and displays (step 130) the charge status of external charging device 48. If recharge of external charging is not complete (step 132), the process again updates and displays the charging status in step 130. Once charging of external charging device 48 is complete (step 134), charging unit 50 displays a message indicative of a complete charging process. The LCD is backlit and consists of 96 (Horizontal)×58 (Vertical) dots with asymmetrical dots 0.35 (H)×0.4 (V). The active area on the LCD is 23.2 mm (V)×33.3 mm (H). The keypad has the following buttons. The INS charge status screen display is divided vertically into three lines of information: status line, recharge progress line and recharge efficiency line. Refer to FIG. 19 and FIG. 20. Therapy On, Therapy Off, Start Charge and Stop Charge are dedicated function keys. When the display is blank and the user presses Therapy On, Therapy Off or Start Charge, software will perform the function and turn the display on. System timeout is <30 seconds. The INS battery status display has 5 settings: 0%, 25%, 50%, 75% and 100%. During recharge, software will display the appropriate quartiles in solid fill and the next higher quartile in a flashing on/off manner every second. The exception is 100%. Even if the INS battery voltage indicates 100%, software will flash the last quartile until the recharge session is complete. The INSR charge status screen display is divided vertically into two lines of information: status line and recharge progress line. Refer to FIG. 21, INSR Charge Status Screen, and FIG. 22, Recharging the INSR. The INSR battery status has 5 settings: 0%, 25%, 50%, 75% and 100%. During recharge, software will display the appropriate quartiles in solid fill and the next higher quartile in a flashing on/off manner every second. The exception is 100%. Even if the INSR battery voltage indicates 100%, software will flash the last quartile until the recharge session is complete. Recharging events are described in screens, information messages and warnings that are displayed on the recharger as shown in FIG. 23A and FIG. 23B. Operational requirements are described in tables that specify conditions for entry and expected changes in control. Refer to the operational requirements for each screen in this section. The i symbol will be displayed on all information messages. With the exception of INSR System Information screen, the user can exit the messages by pressing Audio or wait for the system to timeout. Therapy On and Off will always be active when the messages are displayed. When the user presses Therapy On or Off, software will turn stimulation on/off and clear the information message. The exclamation mark symbol will be displayed on all warnings. All warnings will remain on the display until the user takes appropriate action. Start Screen - Not Docked. Software will display the screen until the user presses any key or the system times out. communication with the INS is established..
soon as successful communication with the INS is established. (On/Off) on the status line. 25 Software will display the INSR charge level on the status line. User familiarity with both external programming unit 2 and charging unit 50 is enhanced through the use of common patient controls and/or display icons across both devices. The user is presented with common controls and displays across both platforms. The primary purpose of external programming unit 2 is to manipulate therapeutic programs such as starting therapy and stopping therapy. The primary purpose of charging unit 50 is to charge or recharge rechargeable power source 24. However, patients may want to control their therapy while charging unit 50 is charging the rechargeable power source 24 of implantable medical device 16. Thus, charging unit 50 is also equipped with controls to start and stop therapy as well as controls to start and stop charging. External programming unit 2 and charging unit 50 both have similar “Therapy On” controls as illustrated in Table 1 and Table 11, respectively. 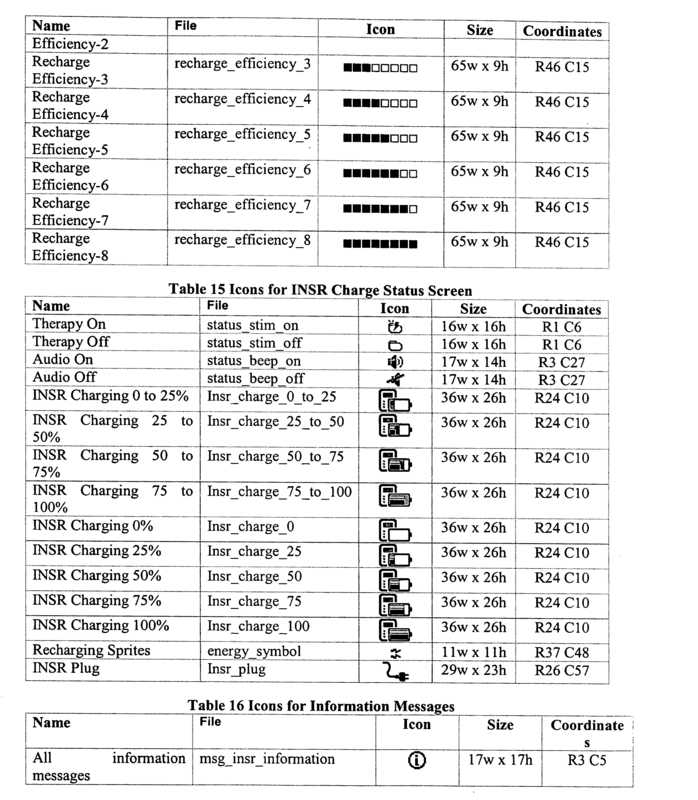 Similarly, both external programming unit 2 and charging unit 50 also have similar “Therapy Off” controls as illustrated in Table 1 and Table 11, respectively. To aid in familiarity by the user, both external programming unit 2 and charging unit 50 also have similar or identical icons to display the same or similar messages to the user. 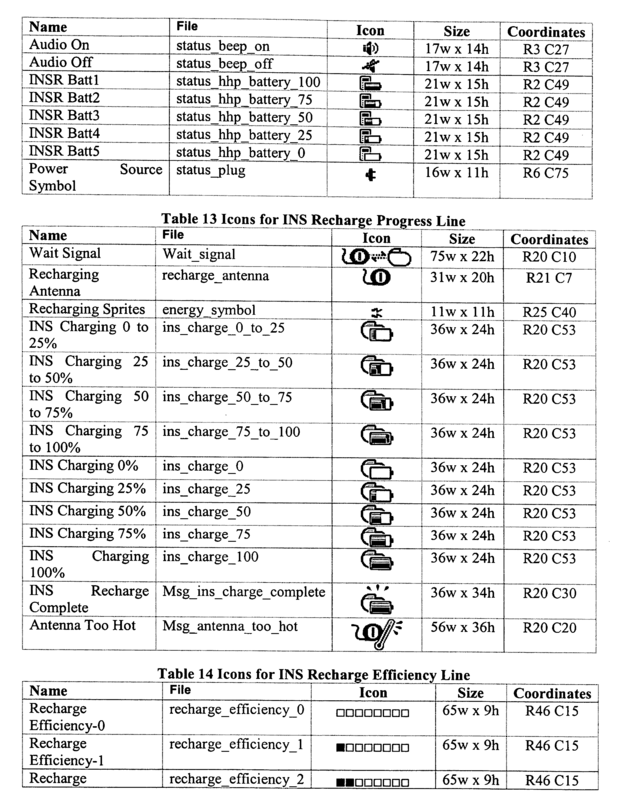 Battery charging level icons “INSR Batt 1”, “INSR Batt 2”, “INSR Batt 3”, “INSR Batt 4” and “INSR Batt 5” icons are similar or identical between external programming unit 2 and charging unit 50 as illustrated in Table 1 and Table 11, respectively. 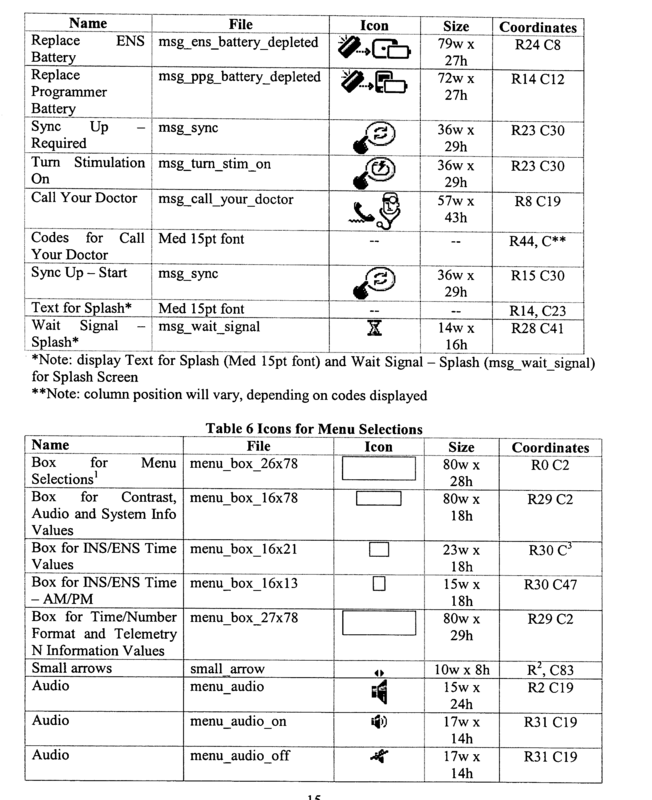 Similarly, the “Call Doctor” icon illustrated in Table 5 with respect to external programming unit 2 is the same as, or very nearly the same as, the “Call Doctor” icon illustrated in Table 15 with respect to charging unit 50. 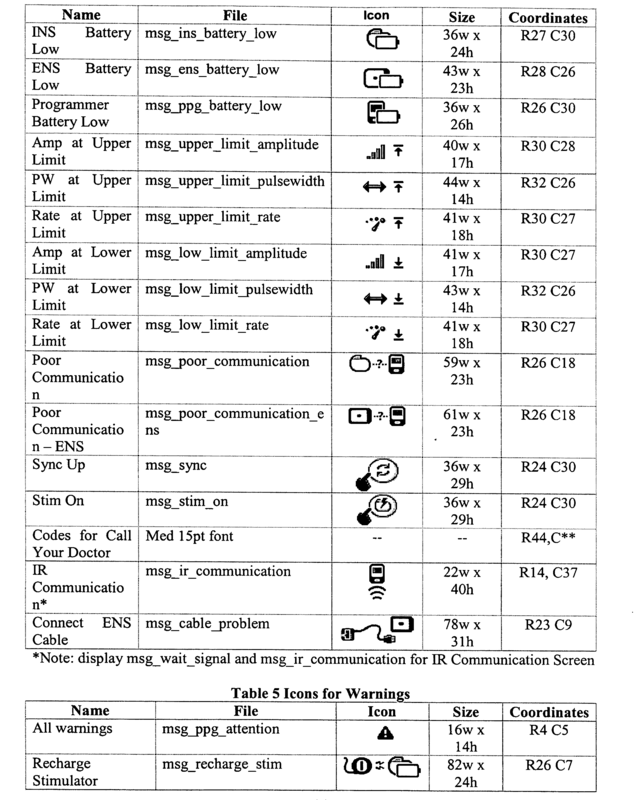 The “Warnings” icon illustrated in Table 5 with respect to external programming unit 2 is the same as, or very nearly the same as, the “Warnings” icon illustrated in Table 16 with respect to charging unit 50. 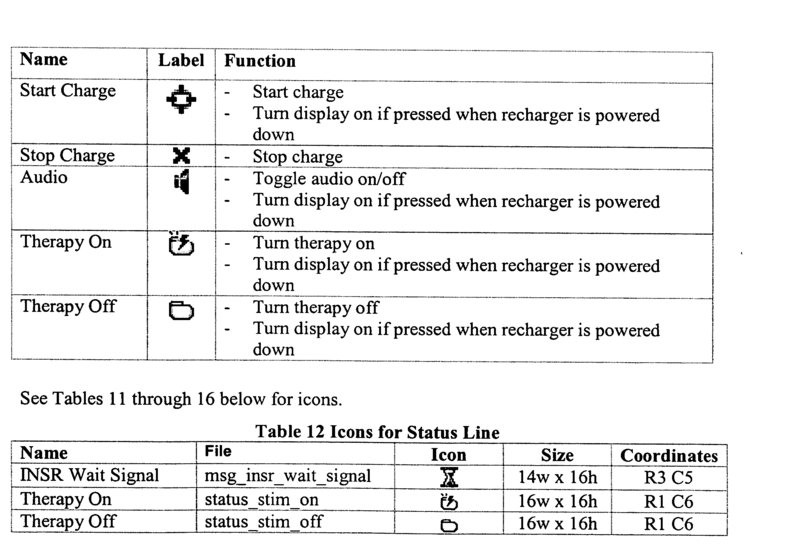 “Audio On” and “Audio Off” icons illustrated in Table 6 with respect to external programming unit 2 are the same as, or very nearly the same as, the “Audio On” and “Audio Off” icons illustrated in Table 11 with respect to charging unit 50. These are examples of controls and icons that are the same, or very similar, between both platforms, the external programming unit 2 and the charging unit 50 to aid in user familiarity. As noted with respect to FIG. 17 describing the process of charging rechargeable power source 24 using external charging device 48, charging unit 50 receives information via telemetry from implantable medical device 16 during the charging process. External antenna 52 contains both primary coil 54 and external telemetry coil 46 and implantable medical device 16 contains both secondary coil 34 and internal telemetry coil 44. When external antenna 52 is positioned properly at or near the site of implantable medical device 16, primary coil 54 can be inductively coupled to secondary coil 34 to facilitate the charging process. Similarly, external telemetry coil 46 can be coupled with internal telemetry coil 44 to communicate information across cutaneous boundary 38 during the charging process. Also as noted above, magnetic shield 36 prevent electromagnetic radiation stimulating secondary coil 34 from reaching the interior of housing 32 of implantable medical device. However, external telemetry coil 46 and internal telemetry coil 44 are sized to be larger than magnetic shield 36 allowing electromagnetic communication between external telemetry coil 46 and internal telemetry coil 44. At step 112 of the charging process illustrated in FIG. 17, a check is made to determine if telemetry between charging unit 50 and implantable medical device 16. Further, the status of charging rechargeable power source 24 is communicated from implantable medical device 16 and displayed by charging unit 50 (step 118). The charging status displayed by charging unit 50 can be the actual known charging status of rechargeable power source 24 as communicated from implantable medical device 16 to charging unit 50. This prevents essentially guessing the internal charging status of rechargeable power source 24 by some external means such as simply by the passage of time. Rather, the actual charging status of rechargeable power source 24, e.g., the battery voltage, can be measured and transmitted to charging unit 50 for display to the user. Typically, inductive charging and telemetry operations are time division multiplexed during the charging operation. That is, a portion of the time during which charging occurs is dedicated to telemetry. During this dedicated telemetry time, the inductive charging by primary coil 54 to secondary coil 34 is momentarily stopped and telemetry allowed to occur. As soon as telemetry has occurred and the required information has been communicated, inductive coupling can be resumed. Typically, only a relatively small portion of the time period during charging is required to be devoted to telemetry. Inductive charging can be stopped only for a short, e.g., a few seconds, to allow for telemetry and then inductive charging can be resumed. Although the time division multiplexing occurs over the entire charging period, only a small portion of the charging time is lost to telemetry. Time division multiplexing of inductive coupling charging and telemetry prevents the possibility of inductive charging from interfering with telemetry signals. Thus, embodiments of the user interface for external charger for implantable medical device are disclosed. One skilled in the art will appreciate that the present invention can be practiced with embodiments other than those disclosed. The disclosed embodiments are presented for purposes of illustration and not limitation, and the present invention is limited only by the claims that follow. at least some of said patient controls and said display icons of said energy transfer unit being common with at least some of said patient controls and said display icons of said patient control unit. 2. A system as in claim 1 wherein at least one of said display icons comprises an icon representative of a state of charging of an energy storage device in said implantable medical device. 3. A system as in claim 1 wherein at least one of said patient controls comprises a control for adjusting said therapeutic output of said implantable medical device. 4. A system as in claim 1 wherein said external energy transfer unit inductively couples energy to said implantable medical device. 5. A system as in claim 1 wherein said implantable medical device has a rechargeable energy storage device and wherein said energy transfer unit charges said rechargeable energy storage device. 7. An external energy transfer unit as in claim 6 wherein at least one of said display icons comprises an icon representative of a state of charging of an energy storage device in said implantable medical device. 8. An external energy transfer unit as in claim 6 wherein at least one of said patient controls comprises a control for adjusting said therapeutic output of said implantable medical device. 9. An external energy transfer unit as in claim 6 wherein said external energy transfer unit inductively couples energy to said implantable medical device. 10. An external energy transfer unit as in claim 6 wherein said implantable medical device has a rechargeable energy storage device and wherein said energy transfer unit charges said rechargeable energy storage device. 12. A method as in claim 11 wherein at least one of said displays icons comprises an icon representative of a state of charging of an energy storage device in said implantable medical device. 13. A method as in claim 11 wherein at least one of said patient controls comprises a control for adjusting said therapeutic output of said implantable medical device. 14. A method as in claim 11 wherein said external energy transfer unit inductively couples energy to said implantable medical device. 15. A method as in claim 11 wherein said implantable medical device has a rechargeable energy storage device and wherein said energy transfer unit charges said rechargeable energy storage device. said energy transfer unit being operable by said patient with less than three operative controls to control energy transfer from said external energy transfer unit to said implantable medical device. 17. A system as in claim 16 wherein said energy transfer unit is operable with two operative controls to control energy transfer from said external energy transfer unit to said implantable medical device. 18. A system as in claim 17 wherein said two operative controls comprise a start control and a stop control. 19. A system as in claim 18 wherein said start control is a start button and wherein said stop control is a stop button. 20. A system as in claim 16 wherein said energy transfer unit further comprises operative controls to start and stop said therapeutic output of said implantable medical device. 21. A system as in claim 16 wherein said energy transfer unit further comprises a control to enable and silence audio feedback from said energy transfer unit. 22. A system as in claim 16 wherein said external energy transfer unit inductively couples energy to said implantable medical device. 23. A system as in claim 16 wherein said implantable medical device has a rechargeable energy storage device and wherein said energy transfer unit charges said rechargeable energy storage device. less than three operative controls to control energy transfer from said external energy transfer unit to said implantable medical device. 25. An external energy transfer unit as in claim 24 wherein said less than three operative controls comprises two operative controls to control energy transfer from said external energy transfer unit to said implantable medical device. 26. An external energy transfer unit as in claim 25 wherein said two operative controls comprise a start control and a stop control. 27. An external energy transfer unit as in claim 26 wherein said start control is a start button and wherein said stop control is a stop button. 28. An external energy transfer unit as in claim 24 wherein said energy transfer unit further comprises operative controls to start and stop said therapeutic output of said implantable medical device. 29. An external energy transfer unit as in claim 24 wherein said energy transfer unit further comprises a control to enable and silence audio feedback from said energy transfer unit. 30. An external energy transfer unit as in claim 24 wherein said external energy transfer unit inductively couples energy to said implantable medical device. 31. An external energy transfer unit as in claim 24 wherein said implantable medical device has a rechargeable energy storage device and wherein said energy transfer unit charges said rechargeable energy storage device. controlling said energy transfer unit with less than three operative controls to control energy transfer from said external energy transfer unit to said implantable medical device. 33. A method as in claim 32 wherein said controlling step is accomplished with two operative controls. 34. A method as in claim 33 wherein said two operative controls comprise a start control and a stop control. 35. A method as in claim 34 wherein said start control is a start button and wherein said stop control is a stop button. 36. A method as in claim 32 further comprising the step of controlling said energy transfer unit to start and stop said therapeutic output of said implantable medical device. 37. A method as in claim 32 further comprising the step of controlling said energy transfer unit to enable and silence audio feedback from said energy transfer unit. 38. A method as in claim 32 further comprising the step of inductively coupling energy to said implantable medical device. 39. A method as in claim 32 wherein said implantable medical device has a rechargeable energy storage device and wherein said energy transfer unit charges said rechargeable energy storage device. said energy transfer unit having an external telemetry coil allowing said energy transfer unit to communicate with said implantable medical device through said internal telemetry coil in order to at least partially control said therapeutic output of said implantable medical device. 41. A system as in claim 40 wherein said energy transfer unit can control said implantable medical device to turn said therapeutic output on and off. 42. A system as in claim 40 wherein said energy transfer unit can control said implantable medical device using said external telemetry coil while transferring energy to said implantable medical using said primary coil of said antenna. 43. A system as in claim 40 wherein said implantable medical device has a rechargeable energy storage device and wherein said energy transfer unit charges said rechargeable energy storage device. 45. An external energy transfer system as in claim 44 wherein said energy transfer unit can control said implantable medical device to turn said therapeutic output on and off. 46. An external energy transfer system as in claim 44 wherein said energy transfer unit can control said implantable medical device using said external telemetry coil while transferring energy to said implantable medical using said primary coil of said antenna. 47. An external energy transfer system as in claim 44 wherein said implantable medical device has a rechargeable energy storage device and wherein said energy transfer unit charges said rechargeable energy storage device. communicating with an external telemetry coil in said energy transfer unit with said implantable medical device through said internal telemetry coil in order to at least partially control said therapeutic output of said implantable medical device. 49. A method as in claim 48 wherein said communicating step is operable to turn said therapeutic output on and off. 50. A method as in claim 48 wherein said inductively transferring step and said communicating step occur simultaneously. 51. A method as in claim 48 wherein said implantable medical device has a rechargeable energy storage device and wherein said energy transfer unit charges said rechargeable energy storage device. ES2230129T3 (en) 2005-05-01 System for spinal cord stimulation.